I grew up in a refinery town in the Middle East, where my father and most of his friends were engineers. 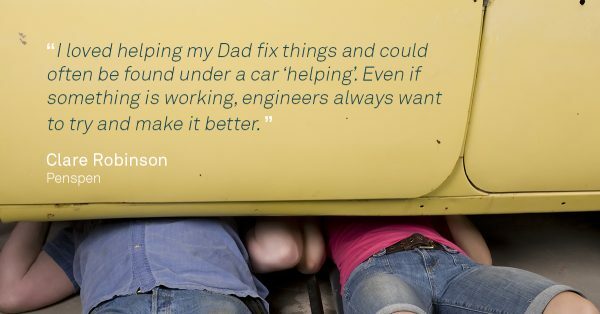 I was probably a little bit unusual in that I loved helping my dad fix things and could often be found under a car ‘helping’. Problem solving is the most important aspect of engineering – even if something is working, engineers always want to try and make it better. I studied Chemical engineering at Birmingham University, where only 10% of the undergraduates were female. I chose the oil and gas industry because I wanted to work in a design office. I thought that I could work on numerous different projects and there were more opportunities in design than in plant operation. I worked in London for a while and then worked at the refinery where my father had worked. I spent a year re-designing the trays and cooling system for the main crude distillation column for a sixty year old refinery. The reality of working with equipment that had been repaired, recycled from other places or just designed for a completely different crude was a bit of a shock. No neat solutions there. Luckily, I came back to London and have been working at Penspen ever since. The variety of work has been interesting. Although, when I say that I design oil and gas pipelines, pumping stations and compressor stations, people outside the industry still look a little bit confused. I try to encourage others into this interesting world by advising at careers evenings at local schools. In my spare time I am a Civilian Instructor with the Sea Cadets. I am supposed to be teaching the Junior Cadets how to row, tie knots and navigate. However, they have also learnt about the differences between diesel and petrol engines, fluid flow and the molecular behaviour of gases and liquids.